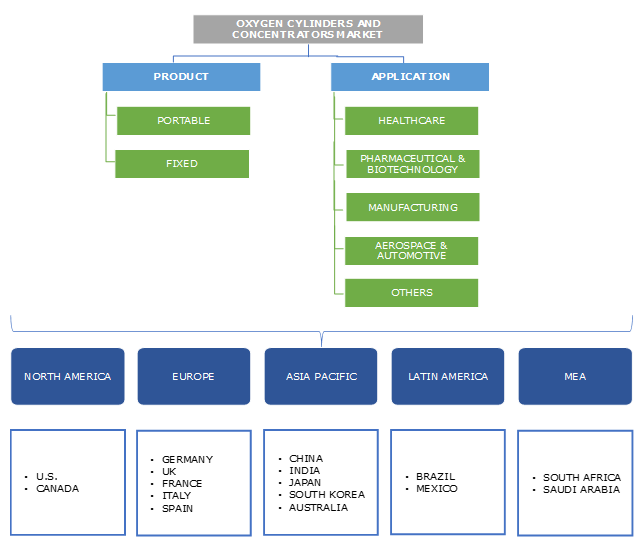 Oxygen Cylinders and Concentrators Market size was valued over USD 2.7 billion in 2018 and is expected to witness 8.9% CAGR from 2019 to 2025. Oxygen cylinders and concentrators market is poised to witness robust growth over the forecast period. Increasing geriatric population base will serve as a high impact rendering factor. The elderly population is at a greater risk of acquiring respiratory disorders such as COPD. Aging leads to decline in effectiveness of defense mechanism of the lung along with weakening of respiratory muscles. Moreover, there is a decrease in peak airflow and the maximum amount of air that can be breathed out after a maximum inhalation. Rising number of smokers and growing exposure to dust particles will further fuel business growth. Cigarette smoke releases chemicals which are absorbed by lungs leading to tissue and cell damage. Inhalation of dust particles and their consequent settling in the airways may lead to inflammation of the trachea or bronchitis. These factors increase the risk of acquiring respiratory diseases. Lack of availability of these devices in developing regions hampers industry expansion. Low product availability is often related to cost and lack of infrastructure. Risk of operational hazards due to unsafe or improper storage practices which may result in serious injuries hampering the industry expansion. Portable devices held significant revenue share in 2018. Increased mobility and independence attributed to its light weight and ease of usage will boost segment growth. Patients prefer cylinders and concentrators which are easy to carry and enable them to perform routine activities easily. Fixed devices are poised to grow at a lucrative pace of 8.9% over the forecast years. Large and heavy oxygen cylinders are usually used to supply gas through pipeline systems at high pressure for equipment such as anesthetic machines and ventilators. Furthermore, these devices also find applications in industrial settings requiring large amount of gas for various processes. Healthcare accounted for the largest revenue size of USD 1,263.1 million in 2018 owing to the large number of patients’ dependent on oxygen. Increasing incidence of respiratory disorders such as COPD, asthma will fuel industry growth over the forecast years. Oxygen concentrators are used to deliver supplementary oxygen to individuals suffering from COPD, chronic hypoxemia and pulmonary edema. They are also used in adjunct treatment for severe sleep apnea. Moreover, oxygen is also required during surgery and intensive care treatment. Increasing number of accidents and fatalities requiring immediate hospitalization and operation along with rising number of surgeries should further propel demand. Manufacturing will witness significant growth in the coming years. Soaring number of manufacturing units such as metals and metals processing, pulp and paper production, glass making, and welding and metal fabrication will stimulate industry expansion. Increasing number of people opting for sports such as mountaineering and scuba will also augment industry growth. These sports require a steady source of oxygen due to lack of availability of the gas in the environment in which they are performed. 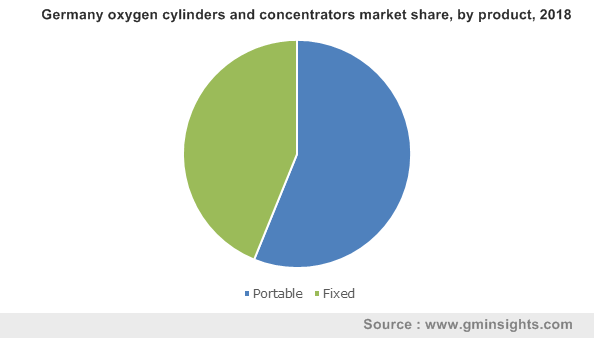 U.S. oxygen cylinders and concentrators market held over 85.0% of regional revenue share in 2018. Increasing prevalence of respiratory diseases and early diagnosis of these diseases will drive business growth. Presence of developed healthcare infrastructure and growing per capita income of the patient’s will further stimulate industry expansion. 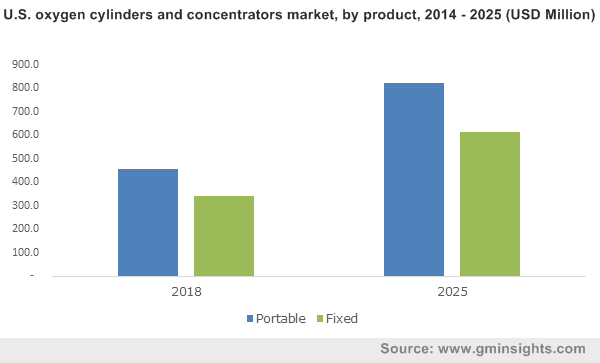 India oxygen cylinders and concentrators market will exhibit robust growth of 9.7% over the forecast timeframe. Presence of large elderly population pool susceptible to respiratory disorders rising pollution levels and burning of biomass fuels will aggravate respiratory problems. Growth of manufacturing sector should stimulate demand due to requirement of oxygen in various manufacturing processes. Adventure sports such as scuba diving are rapidly gaining popularity. Rising number of dive centers in the recent years will surge demand for oxygen cylinders and concentrators. Some of the prominent industry participants include Chart Industries, Inogen, Invacare, Koninklijke Philips N.V., Catalina Cylinders, Air Liquide, MeBer, HERSILL, Tecno Gaz and Cramer Decker. The industry players resort to various strategies such as acquisitions, new product launch and partnerships for strengthening their market position. For instance, in May 2016, Inogen launched Inogen One G4 oxygen concentrator for long term oxygen therapy users. The move has broadened the company’s product portfolio. Oxygen cylinders and concentrators industry is highly fragmented in nature and witnesses’ high industrial rivalry. The rivalry is set to intensity further over the forecast years owing to the entry of new players owing to the favorable regulations. Development of light weight products offering ease of portability coupled with long battery life will drive business growth over the coming years. Asia Pacific and Latin American countries provide a lucrative future opportunity owing to the presence of large patient pool suffering from Chronic Obstructive Pulmonary Disease, Asthma and other respiratory disorders.